« The Ultimate Cyclocross Workout Ride. Sort Of. 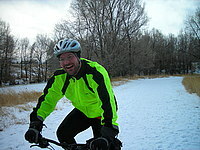 The Monday morning after the heavy snowfall weekend, I set out on my mountain bike shod with studded tires. Wobbling and slipping around in the thick, partially-packed snow for a few feet made me quickly re-think my decision. I wussed out, put my bike away, and began sweeping the snow off my car, feeling defeated. Merrily Cycling Through The Snow! You aren’t going to wipe out unless you do something stupid like turning sharply. Your body automatically corrects your balance as you slip around on uneven snow, chocolate mousse, etc. Cycling in fresh snow is a piece of cake. It is much easier than riding on trodden snow, which is the tricky part. Keep your gear low and spin. Take your time, there’s no rush. Keep your hand off the front brake. Use your rear brake, especially while descending a hill. Your front wheel needs to remain moving and as straight as possible. 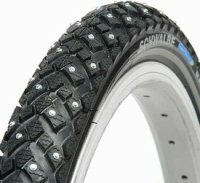 Schwalbe Marathon Winter tires are worth the $60/tire. They bite into ice better than cheaper tires and they will last for several winters, whereas the studs on cheaper tires get very dull after only one winter. After about 15 miles of riding around town in all kinds of different consistencies of snow, I was actually feeling good about riding in snow and enjoying myself. The next Monday, I got up, hopped on my bike, and cycled through the chocolate mousse with glee! I actually purposely plowed through some thicker snow just to put a little excitement into my ride since, by then, there was plenty of bare pavement to ride on. Winter cycling isn’t for everyone. But if you’re looking for an alternate winter transportation method and some serious fun, buy a good pair of studded snow tires, get out there and give it a shot! But, beware, it really does take some practice to get over your initial nerves, or at least it did for me! It’s a lot like learning how to swim for the first time. But after you get past your fears, you gain a lot of confidence and you get a feel for it. Several sources online claim that winter cycling improves your overall cycling stability and confidence on all kinds of terrain, and I can definitely see the truth in this. Here are some useful and interesting winter cycling links! Icebike.org – Lots of great information on how to dress, cycling techniques, etc. Winter Cycling According To Pete – A humorous account of how Pete Hickey commutes by bicycle in the winter. Jill’s Subarctic Journal – A woman in Juneau, Alaska who rides a Surly Pugsley. Very inspiring! Dude, the quality of your blog posts is terrifying. This is better written than a lot of professional stuff I’ve read. You should seriously be writing for a magazine or something! Hopefully a helpful note: in temps below 20F, as the temp drops I have found it increasingly harsh on my lungs. It helps me to slow my effort to the point where I’m not breathing hard, which seems to allow the air in my body to warm up by the time it reaches my lungs. How much I slow down is relative to how cold it is. I’ve been looking at special breather masks to remedy this issue. Oh, yeah, my windpipe gets painful sometimes in those temps. It seems like it is worse on Monday, when I haven’t ridden for a few days, but after a few rides it doesn’t get as irritated. My friend, Travis, wears a balaclava and he says this helps quite a bit. I’ve tended to find on packed snow the technique is to take the straightest lines possible and try to turn as gently as possible. Do you not find that the studded tyres squirm on the roads? Warm Winter Cycling Clothing is a must- particularly gloves and headwear. A snood/ buff is always a brilliant addition to a winter waredrobe.